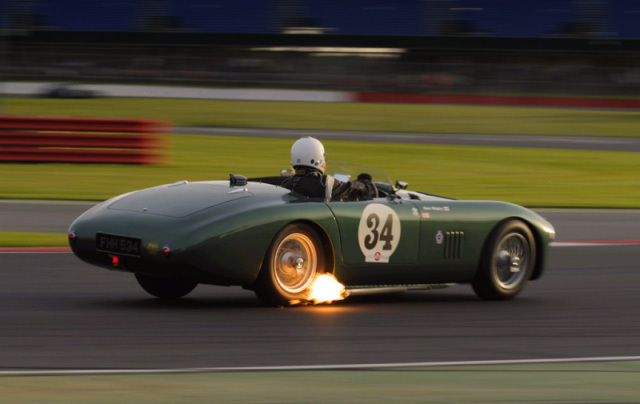 It’s been a busy summer and the usual July Silverstone Classic was a focal point in the UK for the crème de la crème in historic racing. This was particularly true of the Woodcote Trophy Race for pre’56 Sportscars which included 11 Jaguar C & D Types, 10 Aston Martins and a host of Healeys, Allards, Maseratis making up a full grid of 46 starters. Mark Midgley and Chris Woodgate in the DB3 were rightly cautious in the wet qualifying session finishing a conservative 29th. But race day dawned bright and thankfully dry which suited the car and drivers who put on a fabulous display finishing 1st Aston Martin and 13th overall. A great result against some very serious competition.